Medicinal uses: Used by Native Americans as an insect repellant, it was also used as a lotion for wounds, ulcers, and inflamed eyes. It is commonly used today as an astringent, antibacterial remedy for the mucous membranes of the body. It also counters infection as an eyewash or mouthwash. 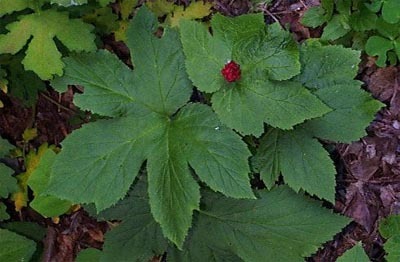 Taken internally goldenseal increases digestive secretions, astringes the mucous membranes and checks inflammation. It should not be used for long periods of time though as it inhibits the gut’s capacity to absorb some nutrients, most notably B vitamins. Cautions: This plant is toxic if taken in excess. Do not take if suffering from high blood pressure. Do not take while pregnant or breastfeeding (Chevallier 107).